The University of Louisville is accredited by the Southern Association of Colleges and Schools Commission on Colleges (SACSCOC) to award associate, bachelor, master, specialist, doctoral and first-professional degrees (DMD, JD, MD). >>Read more. 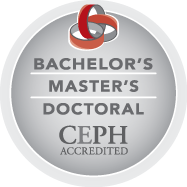 In addition, the School of Public Health and Information Sciences is accredited by the Council on Education for Public Health (CEPH), an independent agency recognized by the US Department of Education to accredit schools and programs of public health. The school received reaccreditation in June 2013 for a period of seven years, the maximum length of time the CEPH will reaccredit schools of public health. We submit regular reports to CEPH and our next accreditation review will be completed before July 1, 2020. Click to view PDFs of the most recent SPHIS self-study and final report of the CEPH reviewers.